Is Anyone Home in Cygnus? 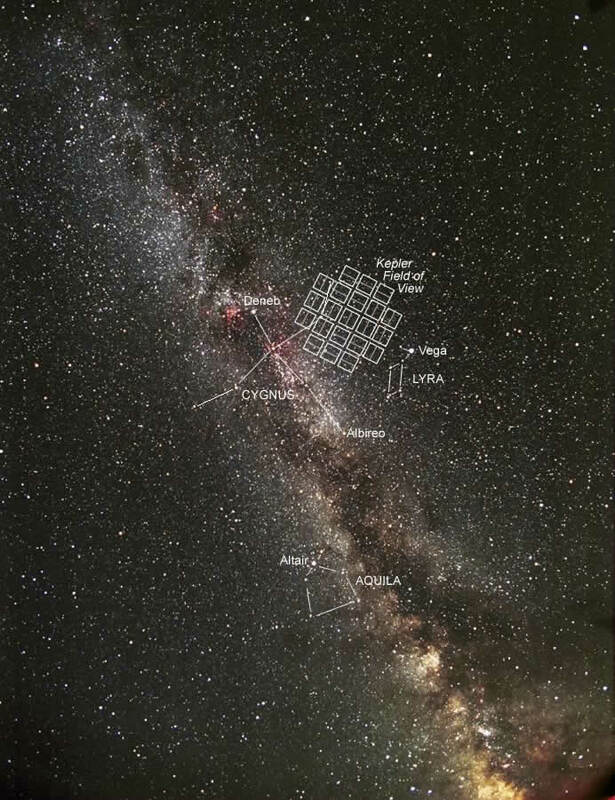 Figure 1: The Kepler field of view in the constellation Cygnus. Kepler monitors 150,000 stars for brightness fluctuations caused by transiting exoplanets. Photo credit: NASA. With the discovery of over 800 confirmed exoplanets to date, astronomers can now make real progress on answering the question: are we alone? The Kepler mission, which monitors 150,000 stars in the constellation Cygnus for transit events, has found its share of planets – over 100 confirmed and more than 2,700 candidates. Some Earth-sized planets have now been found, as well as a number of planets in their star’s habitable zone. But a planet in the habitable zone is not necessarily inhabited. A promising method to detect life on an exoplanet is to find biosignature gases in the planet’s atmosphere. And, while finding life on another planet would be a momentous discovery, perhaps the most exciting discovery of all would be to find intelligent life outside of the Solar System. The authors of this paper seek to do just that. They looked for radio signals from alien civilizations on some of the planets recently discovered by Kepler. The authors targeted the stars with planets found by Kepler (confirmed and candidates) that were most likely to be habitable. 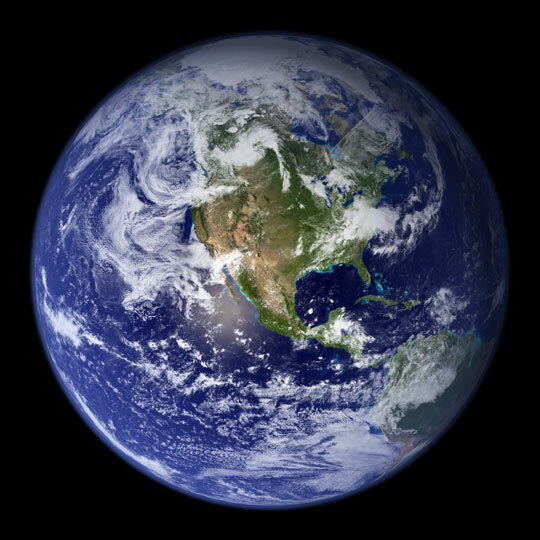 This meant all planets at the right temperature for liquid water on the surface (230 to 380 degrees Kelvin), all planets in systems with five or more total planets, and all super-Earths (planets with radius less than three times the Earth’s radius). This added up to 86 targets. Humans use electromagnetic radiation in the radio regime to communicate, and if alien civilizations do the same, we may be able to eavesdrop on their signal. Furthermore, radio waves are not easily absorbed by the interstellar medium or drowned out by the Galaxy’s own emission, allowing potential alien signals to reach Earth relatively easily. Because the planets in the target systems have all been observed transiting their star, the plane of those planetary systems are aligned towards our line of sight – meaning interplanetary radio communication or radar mapping of objects within the alien’s system would be preferentially directed towards us. 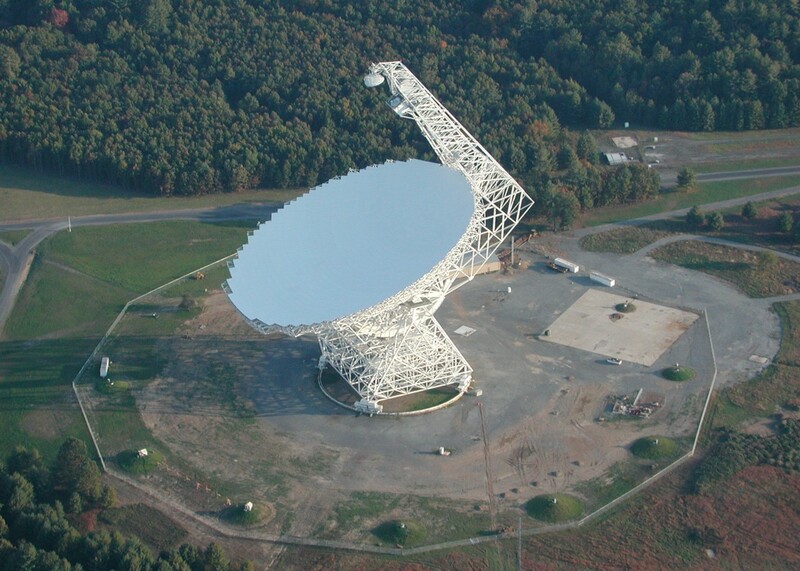 The authors searched for radio signals in the frequency range between 1.1 and 1.9 GHz (wavelengths between 15.8 and 27.3 cm) using the Green Bank Telescope (GBT) in West Virginia. Figure 2: The Green Bank Telescope in West Virginia. The authors used this to search for radio signals from alien civilizations. Photo credit: NRAO. The authors looked only for narrow-band signals (signals that occupy a very small range in frequency, less than 5 Hz). Narrow-band signals are commonly used for communication and radar (at least by humans) while natural astrophysical signals are broadened by various mechanisms. The narrowest natural lines ever detected are from masers and have a spread in frequency of at least 500 Hz. The search for a narrow-band signal was complicated by the Doppler effect (the shift in observed frequency of a wave signal due to the relative motion between the emitter and receiver). Although the authors can account for the orbital and rotational motion of the Earth, the precise motions of the target planets were unknown. Consequently, the authors used a sophisticated algorithm to search their data for signals with frequency shifts of up to 10 Hz per second. On the other hand, the Doppler effect proved useful in filtering out interference from human-made signals. Because extraterrestrial signals would almost certainly have some Doppler shift, the authors could ignore any signals with no shift, as these most likely arose from the Earth. Another technique to remove interference was, during an observation of a target star, to briefly point the telescope slightly off the target. If the signal of interest persisted during both the on- and off-target pointings, the authors knew the signal was terrestrial interference. Finally, they compared the remaining candidate signals to each other. If signals from different targets showed very similar frequencies and Doppler shift speeds (see Figure 3), the authors concluded that these signals were most likely interference. 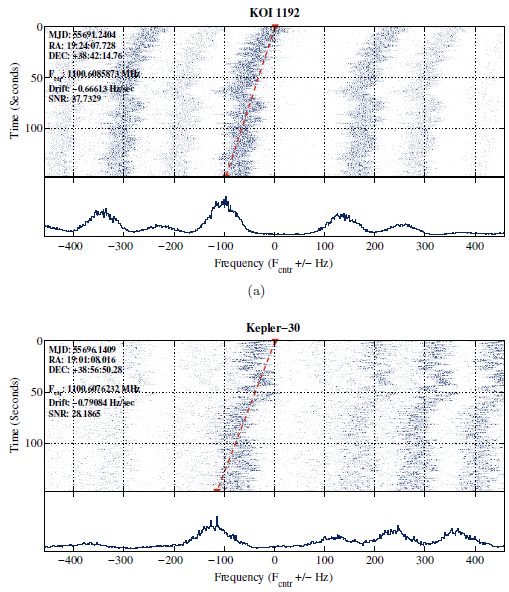 Figure 3: Candidate signals from two targets KOI 1192 (top) and Kepler-30 (bottom). The top part of each plot shows how the intensity of the signal drifts in frequency with time. The bottom part shows the total signal after the frequency drift was removed. Notice that both targets have a similar drift speed and un-shifted frequency, prompting the authors to conclude that this signal arose from terrestrial interference. From Figure 4 of the paper. After culling all interference signals, the authors found no convincing signals from alien civilizations. So this means no one is home in Cygnus, right? Not so fast. The stars in the Kepler field are far away, meaning a radio signal must be emitted with a lot of power to be detectable by the GBT. The most powerful radio transmitter on Earth is the Arecibo Planetary Radar (part of the Arecibo Observatory in Puerto Rico). If an alien civilization directed a radio signal at us from their own Arecibo, it would still be too weak to be detected by the GBT; instead, the aliens would need a transmitter eight times more powerful. The up-and-coming Square Kilometer Array will be roughly 100 times more sensitive than the GBT, allowing for the detection of much fainter signals. Even if aliens had more powerful radio transmitters, the probability that we would, by chance, intercept the beam of their broadcast is very low. However, if the aliens were capable of emitting a powerful signal isotropically (in all directions at once), then a chance alignment between the Earth and their beam would not be required. To emit an isotropic signal, the aliens would need access to more power from their star than is incident on their own planet. This requirement is, in theory, not impossible, and was considered by the forward-thinking astronomer Nikolai Kardashev in the 1960s. He developed the Kardashev scale to classify alien civilizations, where Type I, II, and III civilizations can use all the power of their home planet, star, and galaxy, respectively. 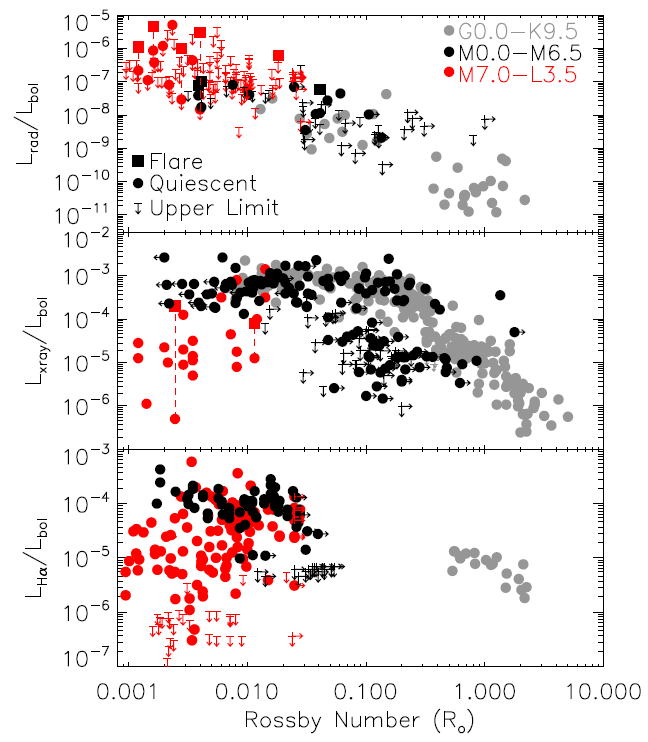 The authors conclude from their non-detections that fewer than one in a million stars host Kardashev type II civilizations that broadcast narrow band radio signals between 1 and 2 GHz. Of course, intelligent civilizations may not use radio waves to communicate at all. Humans did not until about one hundred years ago. Perhaps more advanced civilizations use lasers for interplanetary communication instead. The authors admit that these concerns are difficult to quantify, and that their work only probes a small set of possible intelligent civilizations. How are the radio signals produced by some alien civilization different from the radio signals produced by celestial bodies?